The political war over charges of horse-trading had escalated in Karnataka Friday with HD Kumaraswamy releasing an audio clip in which Yeddyurappa is purportedly trying to lure a JD(S) MLA for destabilising the coalition government. Karnataka Chief Minister HD Kumaraswamy Monday announced a comprehensive SIT probe to “bring out the truth” after an audio clip he released showed state BJP chief BS Yeddyurappa in a purported conversation to lure a JD (S) MLA. “Constitute a SIT to establish the truth. Give me relief in 15 days,” a visibly anguished Kumar said, urging Kumaraswamy after all members said the speaker was known for his integrity and dignity of his office should be protected. Kumaraswamy said he was also “pained” at the charge against the speaker and accepted his suggestion to form a SIT. BJP members said the probe should be limited to the charge against the speaker as otherwise, they had no trust in the government which was likely to misuse the SIT. Hitting back, the opposition BJP in Karnataka has alleged that the audio tape released by Kumaraswamy was a conspiracy hatched by him against Yeddyurappa. “The audio tape having Yeddyurappa’s alleged conversation with the son of a JD-S legislator is part of a conspiracy hatched by Kumaraswamy who is facing severe trust deficit from legislators of his party (JD-S) and its coalition partner, the Congress,” said state BJP general secretary N. Ravi Kumar in a statement here on Monday. “The making of the audio clip and releasing it in Bengaluru on February 8 by Kumaraswamy in the presence of Sharanagouda is a well-planned plot to tarnish the reputation of Yeddyurappa and the BJP,” Kumar, who is also a member of the state legislative council, said in the statement. 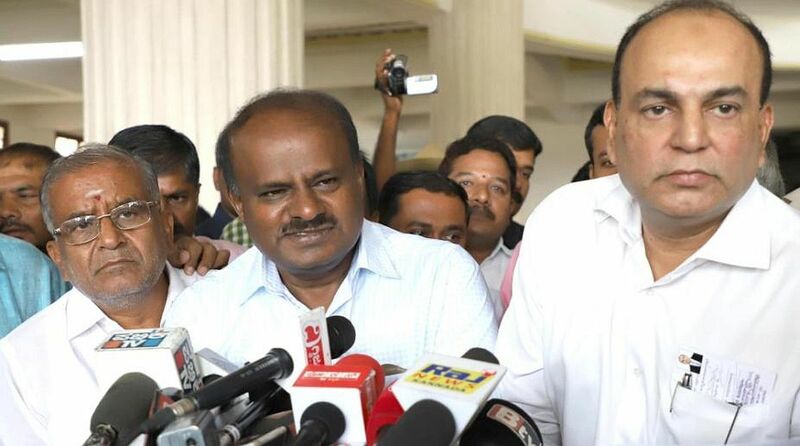 Earlier on Friday, ahead of the state budget presentation, Kumaraswamy attacked Prime Minister Narendra Modi over the disruption of the Assembly by BJP leaders who claimed that the ruling coalition has lost the majority. He said the PM was systemically demolishing the country’s democracy by misleading the people. JD(S) and Congress MPs have accused the BJP of trying to “blackmail” their MLAs by offering them Rs 30-40 crore to resign in a bid to topple the coalition government and said they have “all proof” to support their allegation. Addressing a press conference, the MPs alleged that in the last six months, the saffron party made several attempts to “force” the legislators of the JD(S) and the Congress to defect from their parties. They demanded a probe into the alleged horse trading.